The first major meteor shower of 2012 takes place on the night of Tuesday, Jan. 3 and the morning of Wednesday, Jan. 4. It peaks at 2 a.m. EST (0700 GMT) on Jan. 4. UPDATE: See our wrap up of the Quadrantid meteor shower here and check out this gallery of Quadrantid meteors by skywatchers. To paraphrase Forrest Gump: The Quadrantid meteor shower is like opening up a box of chocolates; you never know what you're going to get! Indeed, the Quadrantids are notoriously unpredictable, but if any year promises a fine display, this could be it. Peak activity is due to occur early on Wednesday at about 2:30 a.m. EST (0730 GMT) and favors eastern North America. 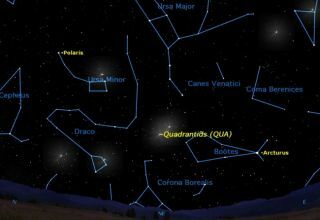 The Quadrantid meteor shower sky map above shows where to look to see the display. The meteors are named after the obsolete constellation Quadrans Muralis the Mural or Wall Quadrant (an astronomical instrument), depicted in some 19th-century star atlases roughly midway between the end of the Handle of the Big Dipper and the quadrilateral of stars marking the head of the constellation Draco. The International Astronomical Union phased out Quadrans Muralis in 1922. Peak intensity is exceedingly sharp: meteor rates exceed one-half of their highest value for only about 6-hours (compared to two days for the August Perseids). This means that the stream of particles that produce this shower is a narrow one — apparently derived within the last 500 years from a small comet. The parentage of the Quadrantids had long been a mystery. Then Peter Jenniskens, an astronomer at the SETI Institute in Mountain View, Calif., noticed that the orbit of 2003 EH1 — a small asteroid discovered in March 2003 — ''falls snug in the shower.'' He believes that this 1.2-mile (2-kilometer) chunk of rock is the source of the Quadrantids; possibly this asteroid is the burnt out core of the lost comet C/1490 Y1. As viewed from mid-northern latitudes, we have to get up before dawn to see the Quadrantids at their best. This is because the radiant — that part of the sky from where the meteors to emanate — is down low on the northern horizon until about midnight, rising slowly higher as the night progresses. The growing light of dawn ends meteor observing usually by around 7 a.m. local time. So, if the "Quads" are to be seen at all, some part of that 8-hour active period must fall between 2 and 7 a.m. In one out of every three years, bright moonlight spoils the view. Over northern latitudes, early January often sees inclement/unsettled weather. According to Robert Lunsford of the American Meteor Society, maximum activity this year is expected on Wednesday morning, Jan. 4 at 2:30 a.m. EST (0730 GMT). For those in the eastern United States, the radiant — that point in the sky from where the meteors will appear to emanate from — will be about one-third of the way up in the east-northeast sky. The farther to the north and east you go, the higher in the sky the radiant will be. To the south and west the radiant will be lower and the meteors will be fewer. Although the moon will be at a bright waxing gibbous phase, it will set by 3 a.m., leaving the sky dark for prospective meteor watchers until the first light of dawn appears at around 6 a.m.
"If your skies are very clear and dark, allowing you to see faint meteors, your rates could top 100 per hour. Observers located in the western portions of North American will have lower rates but will also have the opportunity to see Quadrantid 'earthgrazers,'" Lunsford added. "Earthgrazers are meteors that skim the upper portion of the atmosphere therefore lasting much longer than normal and producing long trails in the sky. These meteors can only be seen when the radiant lies close to the horizon. As the radiant rises, the meteor paths will become shorter with shorter durations." Outside of North America, Quadrantid rates could reach around 15-30 per hour for places north of the equator, but observers south of the equator will have little chance of seeing any "Quads" since the radiant will have little chance to clear the horizon before morning twilight interferes. Finally, so far as weather conditions are concerned, a large high pressure system is expected to dominate the weather across much of the eastern United States and Canada for the peak of the shower meaning skies for these areas should be mainly clear for prospective meteor watchers. However, it is also expected to be unseasonably cold (perhaps "unreasonably" is a better term to use! ), with sub-zero readings possible over parts of upstate New York and New England with sub-freezing temperatures possible down into the Deep South. As one astronomer said prior to a mid-winter meteor watch: "Take the advice of a man whose teeth have chattered on many a winter's night — wrap up much more warmly than you think is necessary!"